Hunter McBee gets the put-out at first base for Miami Trace during a Frontier Athletic Conference game against the McClain Tigers Friday, April 5, 2019. Also pictured for Miami Trace is Cody Brightman. 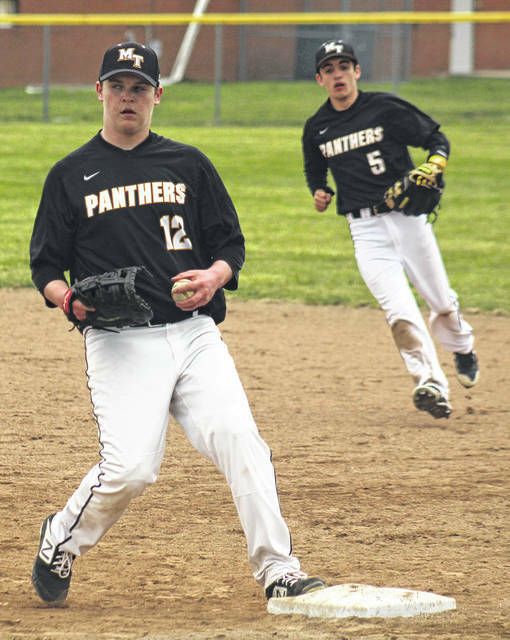 The Miami Trace Panthers varsity baseball team continued defense of its 2018 co-championship in the Frontier Athletic Conference when they hosted the Tigers of McClain High School Friday. In a tightly-contested game, McClain emerged with a 4-2 victory. Both starting pitchers went the distance in this game. Austin Brown took the loss for the Panthers. In seven innings, he allowed nine hits and four runs (none earned) with three walks and five strikeouts. Faulconer went seven for the Tigers with seven hits, two runs (both earned), no walks and two strikeouts. Seven different players each had one hit for the Panthers, who took their first loss of the season, their record now standing at 4-1. The Panthers got on the board first with a run in the third inning. McClain was shut out until scoring four runs in the fifth. The Panthers rallied for one run in the seventh. In the bottom of the third, Mason Snow singled for the Panthers and stole second. He scored on a hit by Connor Bucher. In the seventh, Dalton Mayer had a lead-off infield single and stole second. The next two batters were retired on fly balls to the outfield. Mayer stole third and scored on a hit by Jake Hoppes. A subsequent fly ball ended the game. “The difference I’ve seen (with McClain) is they played really good defense,” Miami Trace head coach Rob Smith said. “Which, they’ve struggled with that over the last few years. “Their pitcher threw strikes and we hit the ball all night,” Smith said. “We lifted some balls and we hit some hard, but they made the plays. Miami Trace is in action Saturday at the VA Stadium in Chillicothe, taking on Ironton at 5 p.m. The j-v Panthers will play Ironton after the varsity game. The Panthers are at Hillsboro Monday and home against Jackson Wednesday. Offensively for Miami Trace: Connor Bucher, 1-4, 1 rbi; Cody Brightman, 1-3, sb; Josh Gilmore, 0-3; Drew Batson, 1-3, sb; Austin Mathews, 1-3, sb; Dalton Mayer, 1-3, 1 run, 2 sb; Austin Brown, 0-3; Mason Snow, 1-3, 1 run, sb; Jake Hoppes, 1-3, 1 rbi. Offensively for McClain: Anderson, 2-3, 1 run, sb, bb; Mossbarger, 1-4, 1 run, 1 rbi; Salyers, 1-3, bb, 1 rbi; Pollock, 3-4, 1 rbi, sb; Booth, 1-3, bb, sb; Faulconer, 0-4; Banks, 1-3, 1 run; Hutchinson, 1-3, 1 run; VanDyke, 0-3.